We have the best guides in the outdoor recreation industry. Our guides are highly experienced and certified. Our guides have thousands of miles of backpacking experience. For every trip at least one guide is a certified Wilderness First Responder. All of our guides are trained in Leave No Trace. Most are Leave No Trace educators. 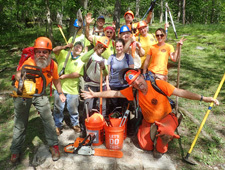 Many of our guides are employed full time in the outdoor recreation industry. Andy "Captain Blue" Niekamp. Andy Niekamp is the Chief Adventure Officer for Outdoor Adventure Connection, which specializes in backcountry adventures. 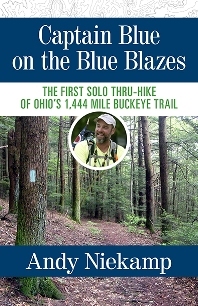 Andy has backpacked over 14,000 miles including four end to end hikes of the Appalachian Trail and thru hikes of the Buckeye Trail, Ohio To Erie Trail, Sheltowee Trace, Long Trail, Ozark Highlands Trail, Colorado Trail, Superior Hiking Trail, John Muir Trail and the Bartram Trail. 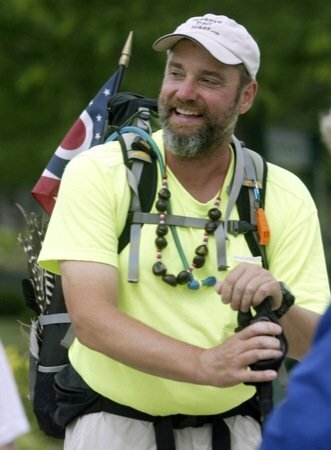 Andy is founder and leader of the Dayton Hikers group, the largest outdoor recreation group in Dayton, Ohio, and a Leave No Trace Master Educator. Andy Niekamp grew up and lives in Dayton and has a passion for long distance hiking which he shares with others. Andy brings his wealth of backpacking experience and his passion for hiking to this program. He has two rules for his backpacking trips. Number 1: Be safe. Number 2: Have fun! Glenn Roberts. Glenn has been backpacking for 30 years, and still hasn't figured out whether he has 30 years of experience, or 1 year of experience 30 times. All of his backpacking has been in the eastern U.S., mostly in Ohio, Kentucky, and Indiana, with the occasional trip to the Appalachian Trail in Virginia and to Isle Royale National Park in Lake Superior. Many of Glenn's trips nowadays are long weekends, with the occasional week-long trip. He is a recreational backpacker; He goes out there to have fun, not to prove anything to anyone. Glenn has led youth trips, was a Scoutmaster and a volunteer for a troubled teens program. Glenn is a gearhead, so don’t be afraid to ask him about gear and equipment. 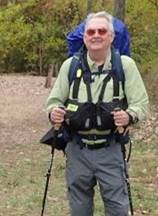 Glenn, who is in his mid-60s, provides insight and perspective for older hikers, whether they are just taking up backpacking or looking for ways to continue to participate. In his other life, Glenn is a CPA with Clark Schaefer Hackett. Glenn is a happily married, a proud grandfather, and a chess player. 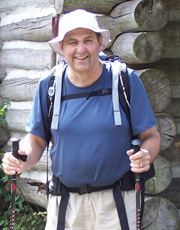 Glenn is the author of two popular articles: How I Got This Way and Where Can I Backpack?. Tama Cassidy. Tama is a naturalist for the Miami County Park District. She loves to hike, backpack and be out in nature. She is a Leave No Trace Master Educator. In her spare time Tama can be found underground exploring wild caves. In 2003 she and her husband were invited to a weeklong underground expedition in Lechuguilla Cave, New Mexico. In 2004 she rappelled Golindrinas Cave, a 1,200 foot pit in Mexico with her daughter and husband. In 2014 Tama spent a week canyoneering in Zion National Park. Shauna "Mola" Sergent. Shauna is a co-organizer for the group Columbus Outdoor Adventures and began backpacking with the group in 2012. Since then, she has backpacked extensively in the area, including trips to Zaleski State Forest, Dolly Sods, Laurel Highlands Hiking Trail, Manistee River Trail, and Shawnee Backpack Trail. In 2016, she prepared for a longer backpacking trip and thru hiked all 2189.1 miles solo of the Appalachian Trail. Outside of the US, Shauna has backpacked through the Japanese Alps, Patagonia (Chile and Argentina), Inca Trail (Peru), and Emei Shan (China). In addition to backpacking, she has a passion for good nutrition and can provide tips on staying healthy on the trails with a vegan, gluten free diet. Kristy Matheson. Kristy's passions are yoga, wellness and being in nature with just about any outdoor activity. 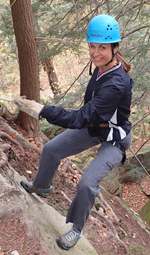 Kristy is an experienced hike leader and an active member of the Dayton Hikers group. In her professional life she is a Licensed Social Worker, and Certified Dementia Practitioner. She is a talented motivational speaker on topics such as women's wellness and the therapeutic benefits of nature based adventure. Kristy is a 200-Hour Certified Yoga Instructor. In addition, she is certified in Wilderness First Aid and CPR/AED. Kristy and her husband have three children and live in Germantown, Ohio. She looks forward to sharing her passion of nature, adventure, yoga and wellness with you. Yvonne "Princess Doah" Entingh. Yvonne began her own outdoor backpacking adventures in 2008 and since then she has section hiked the beloved Appalachian Trail. Mainly as a solo female hiker she has gone on to also complete the Benton MacKaye Trail, Long Trail, Mountains to Sea Trail, Superior Hiking Trail, John Muir Trail and the southern portion of the Eastern Continental Trail hiking from Key West in the Florida Keys to the Appalachian Trail in northern Georgia. She has also completed the Knobstone Trail of Indiana, the Foothills Trail and has backpacked many a mile on the Sheltowee Trace and the Buckeye Trail. As a native of Dayton, Ohio her passion for the outdoors was developed through the Five Rivers MetroParks where she participated in hiking and backpacking excursions. A mother of three grown daughters and a grandmother of four grandchildren Yvonne takes great pleasure in nourishing those relationships. 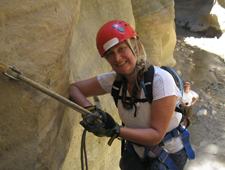 Yvonne loves outdoor adventure travel and is devoted to sharing it with others. Yvonne is certified in CPR/AED, Wilderness First Aid and as a Wilderness First Responder and is a Leave No Trace Trainer. Currently she is taking a course to sharpen her knowledge as a naturalist. Read about Yvonne in the Dayton Daily News. Karen "Tag Along" Power. 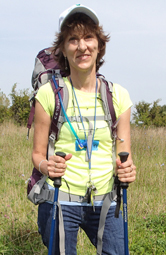 Karen began backpacking in 2014 at the age of 60 after completing Outdoor Adventure Connection's backpacking workshop and overnight trip. 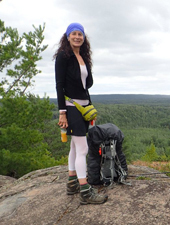 Since then Karen has backpacked many times in many places including the Appalachian Trail, Foothills Trail, Sheltowee Trace, Buckeye Trail, Twin Valley Trail, Red River Gorge, Big South Fork, Cumberland Gap and most recently, a solo hike in part of Maine's 100 Mile Wilderness. She loves the "living in the moment" feeling of backpacking and being outdoors. Karen is a retired college professor, mother of three sons, grandmother to three and enjoys travelling. Karen is certified in Wilderness First Aid and CPR/AED. Jerry Rogers. Jerry has been backpacking, hiking and camping off and on for 60 years. I guess he started when he was one? He's slowed down a bit, and still enjoys getting out for a day or two. He is an experienced backpacker with trips to the White Mountains in New Hampshire, Green Mountains in Vermont, the Adirondacks in New York including two summit trips to Mt Marcy. Other trips include the Laurel Mountains, Pennsylvannia; the Allegheny Mountains and Dolly Sods Wilderness Area in West Virgina. Jerry was a member of the Laurel Mountain Nordic Ski Patrol for eight years where he earned Mountaineering & Avalanche badges. Jerry loves to talk about gear. Just ask. He spent most of his working life in information technology and new homes business. He is currently is a Product Training Specialist for Cabela's World’s Foremost Outfitter®. Thanks for a grand experience! I am glad it rained, and snowed! I could handle it which is one thing I needed to know. Thank you for your personal attention. – Stephen E.
Appalachian Trail Backpacking Workshop & Trip in the Roan Highlands of TN & NC. Ladies: Escape from your stress and daily pressure. Enjoy a wellness retreat with a focus on peaceful spaces and outdoor adventure and yoga. Stay in deluxe cabins. 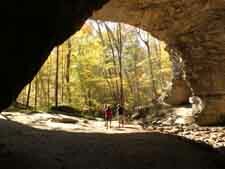 Activities including hiking, cave exploring, yoga, rappelling, wellness and more! Imagine walking 1,444 miles with a backpack carrying the bare necessities of life, 26 maps, and a whole lot of grit. Get email announcements of our upcoming trips and programs. Visit Our Mailing List Page. Copyright (c) 2012-2019 Outdoor Adventure Connection LLC. All rights reserved.